2) does the dog have that predatory je ne sais quoi which is the fortuitous inheritance of not just one trait, but several coequal and mutually dependent ones (a great nose, hunting intelligence, excitement for birds, energy, stamina, drive, etc., etc. ), that a hunting dog must receive from its parentage to make it a competent and worthy hunting dog? There is absolutely no guarantee that all the pups out of a litter - even when both the sire and dam are proven champions - will turn out to be equally good at hunting as their parents. Hunting duds definitely happen (and often go on to make wonderful pets). So, considering the number of factors that must come together for each of these two questions and then both together, an answer in the affirmative could by no means be assured. As I've mentioned earlier, I've fought my way through the first part of the question in my own mind many times, coming down on one side and then the other in ways that felt definitive in each moment in which they were formulated. While I experienced an overall trend towards "yes," I still got regularly hung up on the trigger part. Gore does not and never has bothered me more than the mildest aversion. If someone or some creature is hurt or injured or killed, it's always been something that's relatively easy for me to look past or to alternately see as an earthy and very real signifier of life, inspiring deep pathos in me, whether still present or freshly passed, incarnate and in the flesh, in all its messy glory. Periods of service as both an EMT and an on-call hospital chaplain had settled that for me a long time ago. So, I was very sure cleaning an animal wouldn't be an issue - and I have also cleaned enough fish to know that for certain in advance. Having a driving love for the hunt also was not a concern. Being out in nature with a favorite companion is indeed the romantic part of the whole endeavor and the strongest part of its appeal for me. No, it was definitely the pulling of the trigger that was the potential stumbling block, making a conscious decision that would (if my aim was true) result in the end of a sentient creature, the bird on the other end of the muzzle. THAT was the potential stumbling block, the one that might put an end to the whole pursuit for both man and dog, or at least this specific man and this specific dog. Well, if you've read the other posts, you know how that turned out. But, what about Lincoln? What of the magic combination of traits and drive mentioned above? Having resolved my own introduction, his had not been executed enough to really test the answer. I had taken him during this past summer to a local North American Versatile Hunting Dog Association (NAVHDA) training day just to see what it was like. We took him out in the field with a trainer. To my neophyte eye, he did great. He seemed to sniff out and find the birds that were placed for him just fine. But, others were concerned. They didn't see him getting very excited like many of the other dogs do. His nose was leading him to the right spot, but he seemed to not understand why his nose drew him there. And I got a little worried. Now, don't get me wrong, at that time especially, I would have been just fine if it was determined that Lincoln had no interest. There were plenty of things that we could do together that we'd both enjoy. He is one of the smartest dogs I've ever been around so, whether it was deck-diving or agility or nose work or half a million other things you can now learn and do with your dog, I was sure that we’d find something else. But still, if it didn't seem Lincoln wanted to and/or could hunt, I of course would have been disappointed just a little that bird hunting wouldn't be one thing we could do together that I'd already devoted a lot of thought to and for which I had developed a quickly growing anticipation. After I realized following my own first hunt that on balance I loved it myself and loved especially the magic of the dogs working a field and pointing and retrieving the birds, the question of Lincoln's prey drive became more important and a little more stressful. If it turned out that he just wasn't interested, it of course woudn't diminish my love for or joy in him, but I would certainly need to grieve at least the idea of sharing this very specific and now highly anticipated endeavor with him. This question with Lincoln and my own struggle and misgivings along this path intrigued me. This much I can say after almost a year with this dear companion: Dogs resemble their owners in a host of mysterious ways, from appearances to personality. Some will discount such sentiments as so much woo - but there is actually some research to back it up. Strangers are able to match dogs and their owners merely from photos of their faces with up to 80% accuracy. Most interestingly, the eyes seem to be the key. And there is no question dogs are expert at reading one's emotional energy. Anyone with a little self awareness as to their own inner state just prior to a behavior episode with a wound up pup can attest to that phenomenon. But, whether we are drawn to dogs that most resemble us or life together causes Homo Sapien and Canis Lupus Familiaris to grow toward one another, or some combination of the two (my personal guess), the interspecies bonds certainly can be perceived to work their magic in this peculiar fashion, weaving our good, bad and ugly into something of a shared view and perception of the world around our unit. Perhaps in Lincoln's initial ambivalence was a reflection of my own. Now that I'd moved through it, would we part ways, with me considerably more resolute in continued pursuit and him still refusing to confidently cross the threshold? With the question still unresolved, Lincoln and I joined my friends, Chip and Tom, and their dogs, at Chip's awesome place south of the city for a morning of training just before Thanksgiving. Chip's place has acres of fields and forest, a bird house for pigeons and is just an incredible place to train dogs. For the day, we were going to have Chip's and Tom's dogs sniff out pigeons hidden on the grounds in launchers that would send them skyward to fly back to their house, then a blank gun would be fired to test their steadiness to shot and then they would be released for a frozen bird that would be tossed for them to retrieve. That went swimmingly. 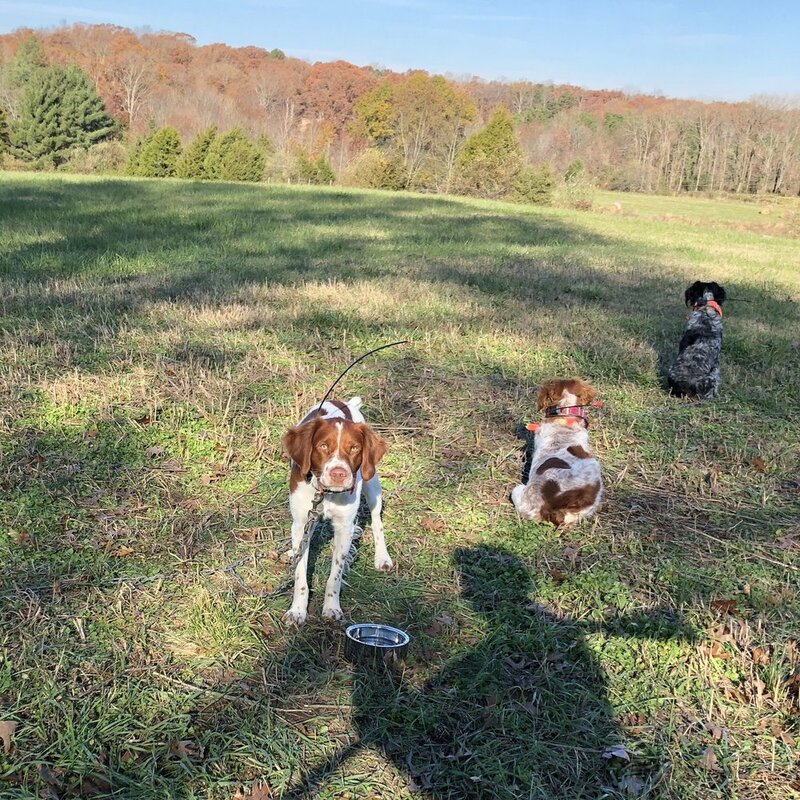 We followed up by doing the same thing with quail, only added shooting them to reinforce the full process of finding, holding steady at point, holding steady at shot through to release and then retrieval to hand. That also went very well, all dogs did to greater or lesser degrees exactly what they should have done. All hunting behaviors successfully reinforced. We headed back up the hill to get Lincoln, patiently waiting his turn on the bird dog chain gang. We released him and off we went. Not bad, I was thinking, he's making his way where we need to go, following us, but also picking up a scent. Finally, we got right up on the launcher with the quail. You could see him pass downwind and through the scent column and his head would undeniably jerk as he hit the scent. Twice this happened, then three times. But, like before, he seemed to have no idea why his nose yanked his head around and he showed little if any interest in the bird itself. Deflated, I walked back up the hill with the guys. I knew that this meant we were going to have try a technique that I really didn't want to try with Lincoln and that even that might not do the trick if he just didn't have strong native prey drive and that might lead to techniques I had even less enthusiasm for and it all might be in vain. All the training programs and philosophies I've come across thus far suggest that prey drive is genetically innate and you really can't do a darn thing to increase it. That said, it can exist in a dog in the form of either potential or activated prey drive. And that was the question we had with Lincoln. Was his initial confused ambivalence just a result of not yet having everything click so he could understand what his own instincts were actually moving him to do or did he just not have the capacity prey drive to be activated at all? While imperfect, the analogy that I have found that has been most helpful to me in understanding how I should think about a dog's prey drive as a more complicated phenomenon was that of a fuel tank to a truck. Prey drive could be seen more like capacity, or the size of the tank a dog might have for instinctual interest in chasing prey. Some dogs incongruously have a one-gallon tank for an otherwise enormous truck. Others are almost all tank and with the fuel of experience they shiver and quake with explosive excitement for anything that hints that they might be about to hunt, from blaze orange to their hunt collars to a shotgun coming out of its cabinet. Experience and training could fill the tank with gas and start the engine burning the fuel of drive for whatever capacity they had, but if a dog has a one-gallon tank, it's going to be a lot less effective hunter and a lot less interested than one with a 30 gallon tank, no matter what amount of training and experience fuel one tries to pour into him or her. To make a long story just a little bit longer, here's the end result of our very first attempt of the first technique we tried. It was a process done in silence on the part of the human hunters, just leaving predator and prey together to work out the natural dynamics. It lasted about 7 minutes and Lincoln went from interested, to intimidated, to very interested, to completely dominant and keeping jealous guard over a bird that he now understood as "his." Having successfully navigated his first exposure, we were going to just do it again the weekend following as we were again training all the dogs. But fate intervened to suggest that the activation was not something we needed to further stoke. One of the quail got away from us when training the other dogs, flew about 100 yards over the field and into a thick tangle of woods. While not in our plan for him for the day, Chip on impulse had suggested we should let Lincoln off the doggy chain gang and just see what he would do. Chip and I had only the vaguest notion where the quail went and so attempted to box it in a search area, Chip walking in the woods in one spot and myself on the other side of the area we thought to be the most likely landing spot. Lincoln seemed uninterested in our choice and I suspected that his failure to follow us was evidence of his lingering disinterest in birds. But, he charged straight into the woods outside of our search box and up flushed the quail - he had absolutely nailed its location. With a nudge from Chip, I shot it for him and Lincoln charged in, delighted in the retrieve. Nose: check! Hunting intelligence: check! Prey drive: check! Now, we could move on to training him to hold point and hold for release to retrieve (the downside of our prey-drive activation technique is having to then go back and train some of that out of him), but here was beautiful confirmation that the gas tank of his drive was in fact more hemi-pickup and less Mini Cooper. And so it seems is my own. There is now added dimension to my eyes and Lincoln's eyes in what we perceive and react to and are driven to find, having crossed together through the garden gate and into the hunt. As far as I can tell, whatever good that was there before in each of us remains, but now we both also possess new capacities and an activated drive to find, harvest and ultimately feed upon the fruit of our pursuit. And, like with so many things in this nascent journey of ours, the thrill and ecstasy of the successful connection was indescribable and bonded us further together. The first quail that was both found by him and that I took down for him will go into a game bird pie, together with the others that we harvested on my first hunt over Chip's dogs. My and Heather's consumption of it, shared with Lincoln, will be both an awesome meal and also a ritual act, celebrating the communion of predator, prey and the affectionate bonds and interdependency of friends and family, all within the transient beauty of an always birthing, dying and turning world.